A native of Sao Paulo who immigrated with her family at 14 to New Haven, Mendes is today both a luminary in the festive nighttime world of samba, bossa nova, and jazz, and by day, a much-respected structural engineer and academician in her quite serious, math-and-science rooted, full-time job at the Yale School of Management. Mendes, a Hamden resident who’s celebrating the release this month of her sparkling solo debut disc, Blame Destiny, is the opening act for the celebrated jazz diva Karrin Allyson on Saturday, August 22, at the free New Haven Jazz Festival on the Elm City’s Green. Mendes sees absolutely no contradiction in commuting daily, as she does, between the seemingly disparate worlds of the art of creating Brazilian jazz and the science of designing bridges and buildings. Both worlds, she insists quite happily, are harmonious and, she adds, thankfully, great places to be at only 31, even though she admits that her heart belongs to music. A high honors graduate with a civil engineering degree from Worcester Polytechnic Institute in Massachusetts, Mendes, who is best known as the hip pianist and bel canto-toned lead singer for the sophisticated, swinging Southern Connecticut-based Brazilian group Sambeleza, maintains that her two professions, which exist in the parallel worlds of her working life, share the common ground of being both analytical and creative. The industrious engineer and busy musician said that just as she designs everything as an engineer with concern for structure, materials and logical guidelines, so she also does, in a similar, analytical and creative way, as a musician designing her sleekly crafted, solidly structured and aesthetically pleasing improvisations and compositions. 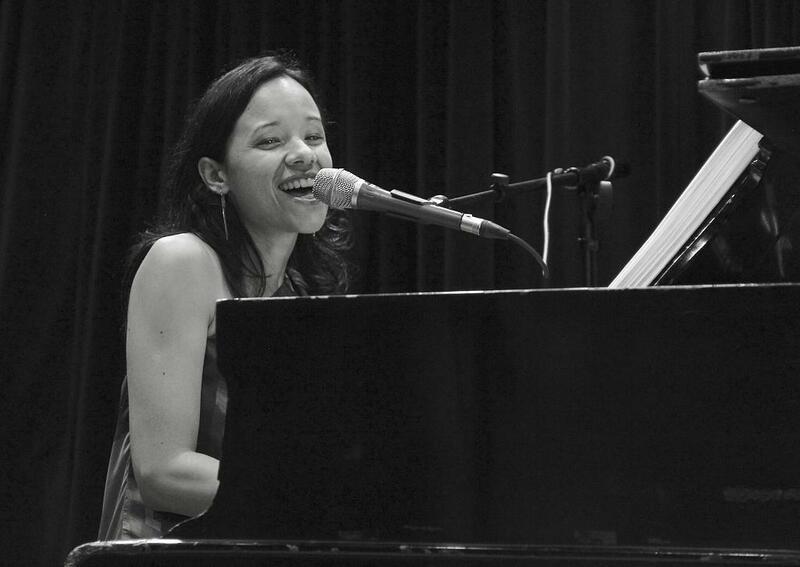 Mendes's original works, including the seven savory selections on her debut disc are mostly celebratory, melodic pieces that warmly embrace jazz, Brazilian music, rock, pop, and the romantic traditions of classic American Songbook ballads, seasoned with a dash of original Mendes flair, feeling, sweetness, and light. Among the delight-filled selections on her independently produced debut disc, which was financed totally by her earnings from gigs, is an amusing, upbeat lament to love’s fleeting impermanence called “Three Months.” Rollicking along on an amusing beat, it almost sounds like a drinking song lamenting, in a vital, upbeat manner, the cold-hearted fact that lovers often lack world enough and time before the marvel of romance too suddenly dies. Whether in structural engineering or music, Mendes creates and shapes works with the distinctive materials that each discipline has to offer. It doesn’t matter if she’s working with the tangible, visible concreteness of engineering, or she’s at the mic or the keyboard transforming the abstract musical concepts of harmony, melody and rhythm into warm, vibrant works of art. “The blues, for example, have a certain form and chord progression that needs to be there. That’s what makes the blues be the blues,” she said of working with the blues and the abstract truth of music’s basic building blocks. “I was very drawn to math and music as a young child,” Mendes said of these two, early powerful, life-shaping forces. “Music and math were my biggest passions as a kid.” As a child, she participated in many piano competitions, concerts and master classes. In her early teens, she earned a scholarship at Magda Tagliaferro, one of the top music schools in Sao Paulo, and was comfortably rooted at home in Brazil basking in her love for her family and her music. Mendes creates and shapes works with the distinctive materials that each of her disciplines has to offer. Sao Paulo’s loss was to be New Haven’s gain as her musical horizon now embraced jazz for the first time when she was in high school. As her musical interests expanded, Mendes never once lost sight of the pivotal importance of education. “There are so many artists out there today who are extremely talented,” Mendes said, “and the music business and music culture is changing rapidly. Most of it today is pop and R&B, with jazz and even classical music, unfortunately, confined to a much smaller space. So that’s why they cautioned me against going into music only,” she said of her parents’ sage advice to hedge her bet on music by doubling up on a secure, practical and prestigious profession like engineering. One positive effect of her giant step from Sao Paulo to New Haven was that, for the first time in her life, Mendes was exposed to and charmed by pop and rock and the whole rainbow variety of music readily available here. Everything in her musical life before coming to the States, she said, had been devoted to classical music, except for the New Age recordings her mother loved to listen to. Now in the States and a long way from Sao Paulo, she was getting into jazz and, ironically, Brazilian music, even mixing genres, learning how to make svelte sambas and bossas dance with a modern jazz sense and sensibility. Classical music had been so dominant in her life, in fact, that it wasn’t until Mendes was in high school that she not only got hooked on American and Brazilian jazz, but also, for the first time ever, took up singing, tuning in to everybody from Madeleine Peyroux and Norah Jones to Suzanne Vega and Diana Krall. Her expressive, pristine vocals, which can mix a sense of vulnerability with resilience and joy, have become part of her effervescent signature sound in appearances in Connecticut clubs and festivals, along, of course, with her well-honed jazz piano playing, rooted in the knowledge and mastery she derived from her classical studies. Her musical palette, both on voice and keyboard, were Americanized, in part, by two of her early favorite role models, Billie Holiday as a vocalist, and Duke Ellington, both as a pianist and songwriter, along with a host of other influences, including mentor/teachers like the noted modern jazz and Brazilian jazz bassist and educator, Jeff Fuller. For her performance at the New Haven Jazz Festival, which is billed as a "Celebration of Women in Jazz," Mendes will tap into originals, including material from her fine new disc, as well as American and Brazilian standards. The band Sambeleza, with Isabella Mendes, guitarist Joe Carter, and bassist Jeff Fuller. Her backup band features guitarist Joe Carter and bassist Jeff Fuller, two fluent practitioners of modern jazz and Brazilian music, who are her colleagues and valued friends and early mentors in the band, Sambeleza. A portmanteau word, Sambeleza derives its name from the words “samba,” the national dance of Brazil, and beleza, the Portuguese word for beauty. Carter and Fuller, a formidable, interactive two-man string section just by themselves, will be joined by saxophonist/flutist Paul Lieberman, Adriano Dos Santos on drums and percussion and special guest George Lesiw on guitar and vocals. Mendes and her sidemen take the stage at 6:45 pm on downtown New Haven’s historic Green. The concert opens with the Jazz Haven All Star Youth Band at 6:00 pm. 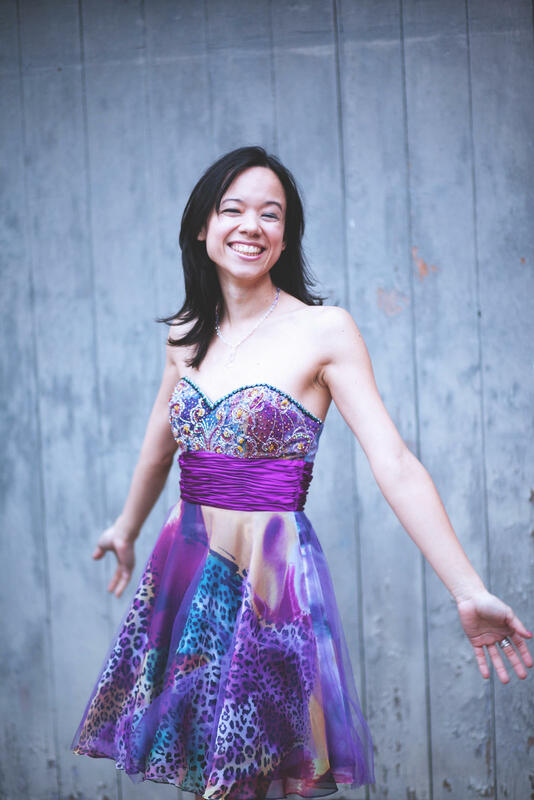 It concludes with Allyson, a versatile, smart, deeply expressive four-time Grammy nominee leading her quartet at 8:00 pm. Food plus arts and crafts vendors will be on hand on the Green. The rain or shine event, which is marking its 33rd year, is presented by the non-profit jazz advocacy group, Jazz Haven. Information: jazzhaven.org. Blessed with solid credentials in the worlds of both jazz and hip-hop, tenor saxophonist, composer, and bandleader Kamasi Washington -- who has two upcoming appearances in the region -- has been hailed as a great visionary, a messiah come to resurrect a moribund, convention-ridden, relic-worshiping jazz through the liberating, healing power of his cutting-edge art. If not elevating him to quite the messianic level, his fervent followers place the charismatic iconoclast on the same prophetic level as such demigod/messengers as John Coltrane and Jimi Hendrix, yet crowned with his own uniquely regenerative aura. A West Coast phenomenon who’s now 34, Washington made an early splash at 19 when making his first national tour with Snoop Dogg, which led to gigs with Chaka Khan and the jazz fusion bassist Stanley Clarke, before going on his first international tour with R&B legend Raphael Saadiq. A genre-bender and blender who crisscrosses all stylistic boundaries, the saxophonist has performed with a number of varied jazz stylists including McCoy Tyner, Kenny Burrell, and George Duke, as well as with such diverse artists as Lauryn Hill, Jeffrey Osborne, Mos Def, Harvey Mason, and Quincy Jones. More recently, he left his individual imprint on hip-hop recording artist Kendrick Lamar’s release, To Pimp a Butterfly. 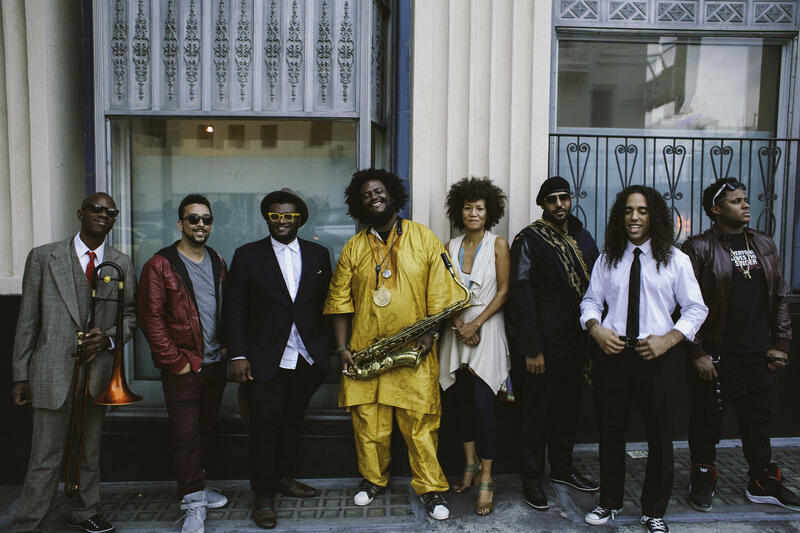 Kamasi Washington and his band. 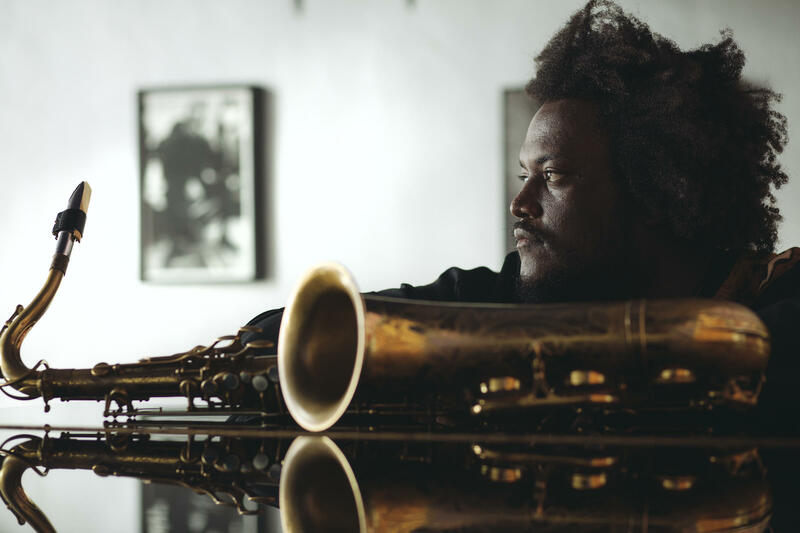 Now on an ambitious pilgrimage promoting his aptly named, expansive release, The Epic (Brainfeeder Records) -- a high-powered, 172-minute, triple-disc set -- the ascending saxophone virtuoso sets down Friday, August 21, at 7:45 pm at StageOne in Fairfield, (203) 259-1036, and on Sunday, August 23, at 7:00 pm at the Iron Horse Music Hall in Northampton, Massachusetts -- iheg.com and (413) 586-8686. Already exalted as a figure “unlike anything jazz has seen,” Washington has created a magnum opus with The Epic. Declared a masterpiece by critics, the titanic work is armed with shock and awe unleashed by its freewheeling firepower featuring a 32-piece orchestra, a 20-person choir, and 17 songs with orchestrations both written and conducted by the audacious, Los Angeles-based maestro. Pulsing underneath this wall of sound is what a press release describes as Washington’s “otherworldly ten-piece band, each member of which is individually regarded as among the best young musicians on the planet.” Adding extra charge to the explosive solos of these ten plenipotentiary, planetary potentates and apostles of radical innovation is a double rhythm section composed of two drummers, two bassists, and two keyboard players, with a string orchestra and choir arrangements wafting in and out of the thickly textured mix of transfigured genres, voicing Washington’s epic new testament to change.